John grew up in Santa Barbara and attended the local public schools. 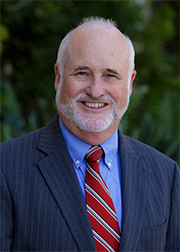 He returned to Santa Barbara after college, the Navy, and law school and joined Griffith & Thornburgh in 1974. He was elected to two terms on the Hope School Board, and has served in leadership positions for several local non-profit organizations. As an avid golfer, he served as the President of the Southern California Golf Association and has enjoyed traveling to the magnificent courses of England, Ireland, Scotland, Canada, and Australia. John and his wife Helen have been blessed with three wonderful children and nine remarkable grandchildren. Professional Liability – Successful defense of claims against attorneys and accountants. Trust Litigation – All aspects of trust litigation, including asserting the rights of beneficiaries and defending the actions of trustees. Employment Law – Successful defense of employers. Family Law – Representing both men and women in all aspects of family law including pre-marital agreements, dissolutions, and custody matters. Advising businesses on employment and general business matters. Admitted to practice before all California state and federal trial and appellate courts.